Last year's Silver Globe album thrust Jane Weaver back into the spotlight. Chosen as album of the year by Piccadilly Records, its psyche undertones and dreamy vocals made her sixth album a surprise hit. We caught her at a rare live show at a packed sold-out Gullivers supported by the excellent Welsh trio Tender Prey. Naming your band after a Nick Cave And The Bad Seeds album is a statement of intent. Fortunately, Tender Prey are more than capable of backing up that intent with their songs and stage presence. 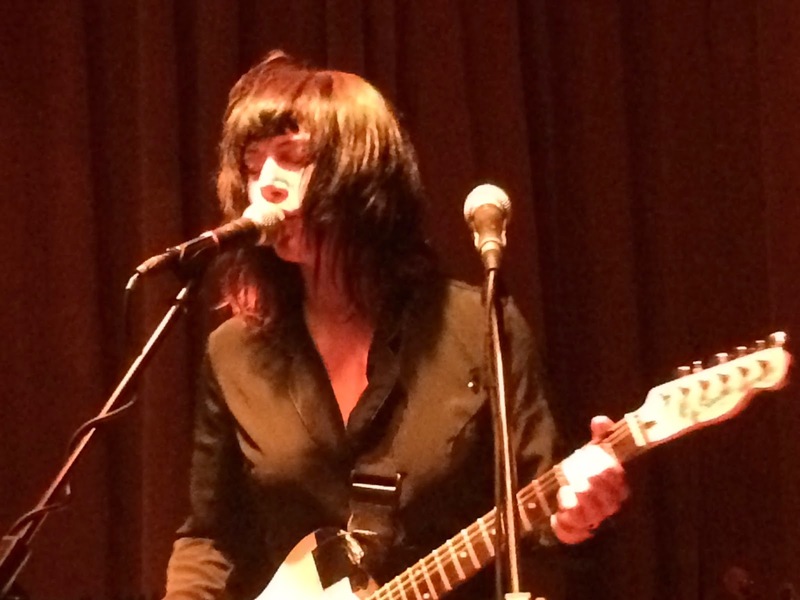 Technically Tender Prey is Laura Byron, a feisty in-your-face guitarist and vocalist, fond of fierce guitars and with a voice that invokes thoughts of P J Harvey's darker moments. The set features a couple of tracks from last year's excellent Tequila Worm EP as well as four unreleased tracks, but it's their forthcoming split 7" with Jane Weaver entitled Undisputed Heavyweight that grabs our attention most out of a set that's full of lo-fi filthy garage riffs and staccato drumming. The single hints at a more radio-friendly accessible sound without compromising any of the raw energy that means there's not a dull moment in the set. It's a contrast to what's to come from the headliner, but they come pretty close to stealing the show. 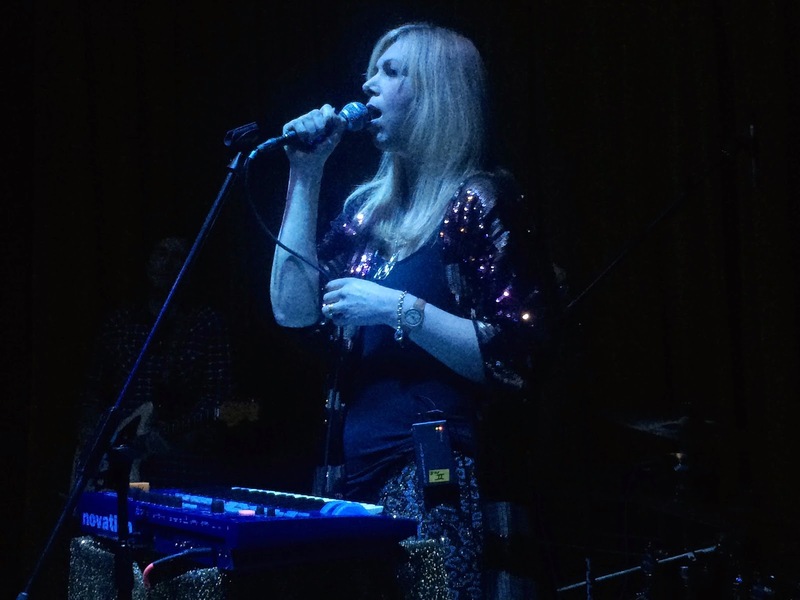 Jane Weaver looks nothing like your archetypal pop star, other than the shiny cape she dons as she makes her way to the stage. She's set up with a guitarist, bassist, drummer and a magician who plays keys and controls all sort of effects. But it's Jane that everyone is here to see and listen to. Silver Globe stood out because of the way her voice drifted just under the surface of the sounds her band were creating, popping up for air at points, beautifully harmonic, perfect control of pitch and tone. Whilst so much is made of the likes of London Grammar and Chvrches, it's Jane that possesses that perfect voice for this ethereal dream pop. Other than opening track The Fallen By Watch Bird, the rest of the set understandably comes from Silver Globe. Again, it's the track from the forthcoming single release Don't Take My Soul that stands out, it's the sort of song young chanteuses would kill for, although you know they wouldn't deliver it with the panache and grace that Jane does. But there's not a weak song amongst the nine they play, and the debut performance of Cells is an unqualified success. Argent and The Electric Mountain garner the best responses of the evening, but you sense this crowd know every word of every song as you pan round and scan the engrossed faces. She engages, somewhat shyly as if the response she's getting feels undeserved, with her audience who hang on every word, whether spoken or sung, and takes to a melodica at one point as well as playing keyboards, but it's when she moves away from them that she's at her most natural, a modern day Nico figure, losing herself in a trance at points during the set. Whilst her first five albums have only scraped the surface of the public's conscience, this one has slowly percolated through to the extent that she's already sold out the much larger Deaf Institute next month. The band also contribute massively to the sound as well, creating the perfect backdrop for the voice, but in extended instrumental sections taking centre stage, stretching out the songs, fabricating a kaleidoscopic mix of traditional guitar and drums mixed with clever sampling and keyboard trickery that matches the psychedelic vibe of the record. Tender Prey's official website can be found here and they are on Bandcamp and Twitter.